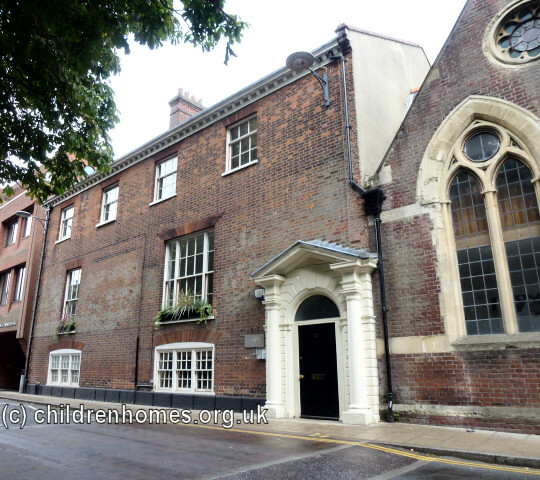 The Orphans' Home, in Norwich, was founded on November 30th, 1844, by a group of women Quakers which included the author Amelia Opie. The Home, which received only girls, moved into premises at 54 Pottergate. The original intent of the establishment had been to provide comfortable lodgings for female factory workers who had no family to reside with. However, in 1848, the focus changed and five female were admitted to be boarded, clothed, educated, and trained for domestic service. In 1870, the Home moved to new premises in Chapel Field (or Chapelfield) East, formerly occupied by the Bowling Green Hotel. The establishment now accommodated 24 children who were aged five or more at their date of admission. Its object was now stated as being 'to provide a home for girls, destitute children of married parents, who are both dead; and to educate and train them for domestic service, or some other means of supporting themselves respectably and becoming useful members of society.' Cases received in order of application and with the recommendation of a to the charity subscriber of £1. 1s or more. Those admitted were expected to make a payment of 2s. 6d. per week. The home closed in 1932 and its assets transferred to Anguish's School of Housecraft, with some of the inmates transferring to Girls' Hospital School. The Chapel Field East premises are now in private residential use. Norfolk Record Office, The Archive Centre, Martineau Lane, Norwich NR1 2DQ. Has Admissions registers (1891-1921, 1923-30); Medical certificates and related papers.